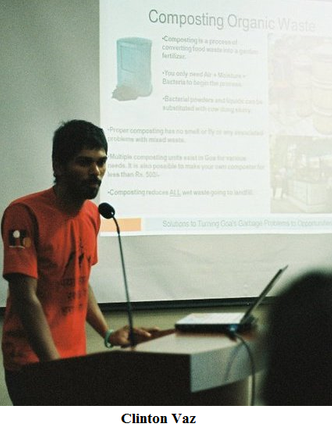 Speaking at the event Shape Connect Goa (held at the Kokum Design Centre, Porvorim) on how we need to be conscious consumers to deal with the escalating garbage problem, Clinton Vaz, proprietor of vRecycle in South Goa, says, ‘The average Indian produces 200 grams of waste per day… that is in rural India. We do not live in rural India. The average Goan would generate about 800 grams. The average Western person in America or Europe will produce 3 kilos to a kilo and a half depending on where he lives and what he produces.’ Most of the waste that is generated is the result of our conscious choices. Although the Western garbage scene may seem far more daunting to take on, we Indians are catching up quickly to the same amount of waste creation. Products these days are manufactured to have the minimum durability as opposed to those that were produced years ago. Compare the toys of bygone years with what we are beguiled into buying now. ‘I still have the metal truck my grandfather gave to me and my nephew now plays with it,’ says Clinton. Apart from this, we are spoiled for choice when it comes to picking a particular type of product. For example, on a shopping trip to a supermarket in Sweden, Clinton was assailed by a plethora of choices by way of milk brands. These then were further categorised in terms of high fat milk, low fat milk, normal fat milk, ecological milk, soy milk, etc. This is a far cry from the days when we had no option but the milkman. All the packaging generates a huge amount of waste, which we assume is taken care of by the garbage collector. But what happens after the rubbish has been collected? Our choices as consumers matter in curbing this exponential growth of rubbish and there are simple things we can do to change the state of affairs. Before the Panjim city market, to the left, there is a composting unit where you will find vegetables for free. This is produce that is going into the garbage because it does not appear fresh, has some blemish or has not been bought within a timeframe. About 52% of fruits and vegetables, 50% of seafood, 38% of grains, 22% of meats, and 20% of dairy go into the waste. A survey of the items in our refrigerator will tell us how much we throw away simply because it was too old. There are so many food items we buy that we do not really need. We need to plan what we are going to eat in the week and allot one day to eating leftovers. Although we have been admonished as children to take only as much as we can eat in our plates, we have to remind ourselves of this as adults. 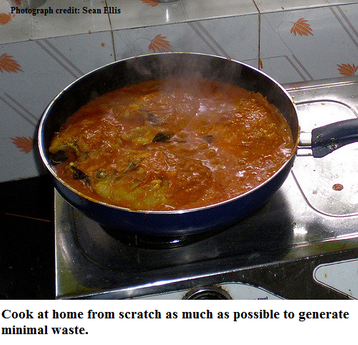 Readymade food from restaurants can be brought home in one’s own containers instead of those supplied by the restaurant, to avoid generating waste. All organic waste can go into a composting bin. Carrying your own shopping bags is vital to prevent the accumulation of plastic bags. Buy clothing at thrift shops and mend clothes or upcycle them into other items such as floor mats, bags, mops, etc. Substitute disposable cutlery and utensils at parties, picnics and events with reusable ones. Many companies have begun using disposable containers in place of reusable containers for their products. Today it is difficult to find soft drinks in glass bottles as compared to PET bottles because we choose mostly to have the drinks in PET bottles. Opting for glass bottles will allow them to be reused by the company. Goa is one of the few places in India where there is a refund system for the glass bottles. People are charged a deposit, and if you return the bottles, you get your deposit back. Beer companies, however, have realised that people do not really care about the deposit and now only Kingfisher maintains the system, and who knows for how long. Now the others still charge the deposit for the waste that is being produced, but do not return it if you go back with the glass bottles. Consumers should demand that this system be reinstituted. 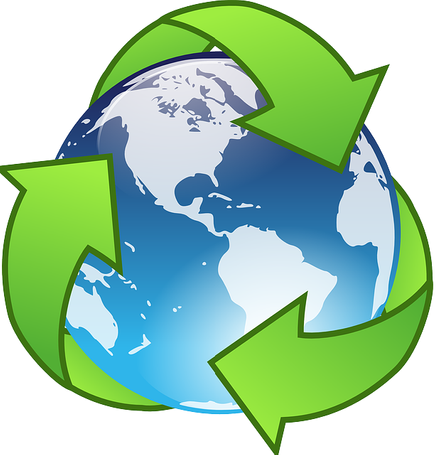 Reusing and reducing is less practiced than recycling. Recycling is most often nothing but down-cycling. Aluminium waste can be turned back into aluminium through a long complicated process, as is the case with glass, but the same process is not possible with paper and plastic. Paper has fibres that reduce with every recycling attempt and can be recycled up to 5 to 6 times. The grade of paper is lowered every time it is recycled. In the case of plastic, it can be recycled just once or twice. ‘We have to realise that recycling is not the permanent solution. Before recycling we have to reduce and reuse,’ says Clinton. With the assortment of ecologically viable items available nowadays, it is difficult to choose from fair trade, organic, non-animal tested, etc, products. And again, the Western world complicates matters with the introduction of a number of brands with sub-labelling. It would simplify choices to have a merging of all these types of products. The average Indian would still not be able to afford these, so the responsibility falls on the shoulders of the upper middle class Indian to make a difference. The best organic and healthy option which is not highly expensive would be produce grown and livestock reared locally. Converting to vegetarianism can help reduce your ecological footprint considerably. Cooking and eating at home as opposed to eating out, or consuming ready-to-eat food products with all their excess packaging, can reduce waste too. ‘When you go shopping, don’t bargain with local sellers. When you see a kunbi woman selling lady’s fingers, whatever price she quotes, pay her that and take it, because that will be the actual cost of growing those lady’s fingers,’ says Clinton. Obsolescence is another great contributor to electronic waste accumulation. Products such as phones and computers are constantly upgraded and the older models phased out. Though it is cheaper to repair these products in India, the non-availability of parts specific to a particular model can make is more feasible to buy a new product. In recent times, one finds that clothes, shoes, electronic goods and so on are manufactured to have a shorter shelf life. In certain instances, they are deliberately designed to fail. Another example of forcing customers into buying products is the HP printer range which compels one to buy a new HP inkjet cartridge every time the ink runs out. Epson has started the Ink Tank Revolution, where the printers have a tank that can be refilled with ink, thus doing away with company specific inkjet cartridges. This has forced HP to follow the same system. The Light Bulb Conspiracy is a documentary available on YouTube that reveals the strategy of planned obsolescence used by major companies to bring in profit. It is important to remind ourselves about where our waste ultimately ends up and how it affects the environment. We have animals dying because of the consumption of plastic, land is being contaminated (leaching in landfills) and the pollution is having a detrimental effect on humans already. It is time we wake up to this monumental problem and take action.